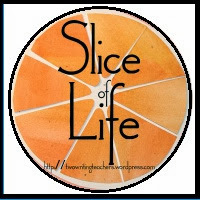 Two Writing Teachers Slice of Life-Thanks to Stacey and Ruth for hosting this weekly opportunity to write about slices of our lives! Choose your own adventure, adventure! Today's Slice is about creating a choose your own adventure story...please join in adding your prediction on how you think the three things pictured below form a silly slice. You are invited to be as creative as you would like to be on the comment. The true story behind the pictures will be revealed on Wednesday. Be sure to check back to see other slicers' creative predictions as well as the true story...Have fun, the adventure is all up to you this post! "No, this isn't me. I mean, she doesn't have a moustache and glasses, so I can't be her. I don't know where she went. I didn't put Spot in the toilet. I think she was just giving him a bath. So I am, I mean, she is very sorry." I don't know what she was thinking, but she did put Pandy in the toilet-maybe had a bath in mind. Thanks for posting your adventure. How about...I want to be a Panda Bear when I grow up so I can go the bathroom any place I want! Cute cute idea Amy! Thanks Lynn, creative thinking here! You sure have me thinking! I am guessing you want to pretend you are someone else while you "get" someone "potty trained" and then in the end, have lots of cuddle time! Thanks for your thinking here. I wish we were potty training...that would be great! "I told you not to flush your toys down the toilet. Now, we'll have to call the plumber." You are funny Diana! This is partly what happened! "It's such fun to pretend & I especially want to be just like my panda bear. I will dress up just like her, & then do all the things he does, maybe even take a bath, & sometimes go to the potty." Amy- this is hard! But so creative. 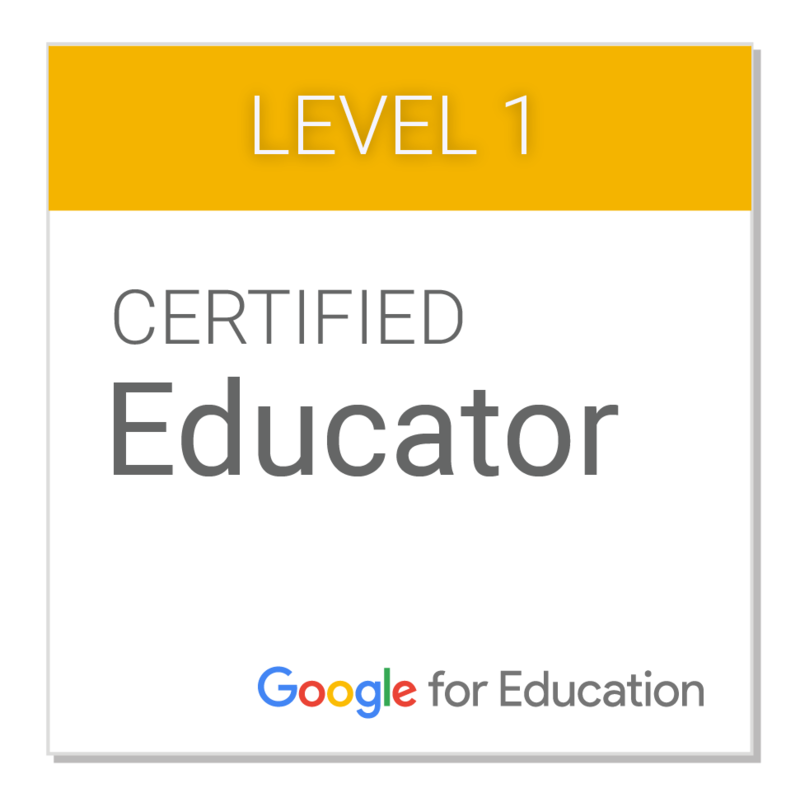 I think my former students would do a better job than I did. Thanks for the fun. "I am not YOUR child. This bear is. See how he looks at you with those big moony eyes. He's asking you to take him to the potty. No, I DO NOT HAVE to go potty, he does!" I think your slice might star Nattie, the budding artist from last week's slice. I must say I am growing quite fond of her. 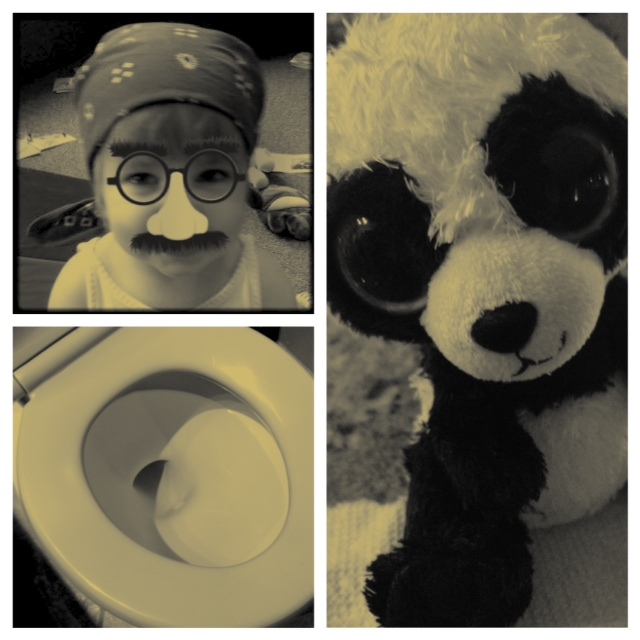 Let me think...using picture clues and prior knowledge...perhaps someone has an "accident" near the toilet and a detective (using a disguise) tracked down Mr. Panda Bear as the offending party.. Case solved. Pirates, pandas, and potties - all three have to pee just like you and me. You make me laugh Dana! This is tough! I'm inclined to say that the pirate flushed the panda down the toilet, but I have a feeling that's too easy. I cannot wait to find out what really happened! Way to keep us on the edge of our seats! Yes, Pandy went into the toilet...another mommy journal moment. So here's the real story...Nattie, pirate in disguise, panda-napped Pandy and made him walk the plank-into the toilet he went (much to Kam's dismay and disgust). Poor Pandy, got soaking wet and spent the next 24 hours wrapped in gauze towel to dry. Luckily, Pandy was not flushed as our little pirate does not yet have the strength to pull the handle. Our lesson this week was to not leave the bathroom door open-really! I have to laugh or I will cry-Kameron never did the kind of things Nattie is doing these days...in a matter of seconds trouble erupts. I think if she knew how to put on a disguise she probably would have! I loved the pictures and that you asked for us to figure out the story. Very funny. I came back to see-I didn't 'get' that she was a pirate because all I saw was that she was like a panda-oops. So glad you finally told what happened. They are very interested in the potty, aren't they? What fun, Amy. Hope Pandy is dry now!